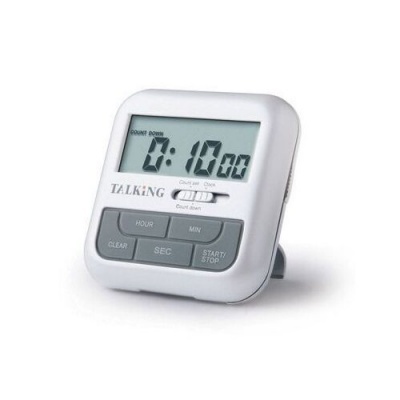 The pocket-sized Talking Countdown Timer counts down and speaks in a synthetic female voice. It boosts independence for individuals with visual impairments or dementia. While sounding the alarm when the countdown reaches zero is important, announcing the time remaining is just as crucial for keeping track of your activities. The Talking Countdown Timer can count down from 23 hours, 59 minutes and 59 seconds, while a synthetic female voice announces the time left, making it highly suitable for individuals with visual impairments. As residents of care homes may have varying requirements and limitations, it's important that there can be a reliable source for indicating time between or during activities. With the Talking Countdown Timer, time remaining during or in between activities is announced by a synthetic female voice, making it ideal for users with visual impairments. The timer also emits an alarm when the countdown reaches zero. When a patient suffers from dementia, they may require prompts to remind them to move on to the next activity. The Talking Countdown Timer is ideal for providing a frequent reminder of how much time is remaining, something which can assist in easing anxieties, while also alerting the individual when the time has arrived. Some residents may feel that moving into a care home or similar environment will hinder their independence, but with the Talking Countdown Timer this doesn't need to be the case. They can keep track of the time spent on or in between activities, allowing them to receive remaining time announcements, and in turn allowing them to retain and encourage more independent living.